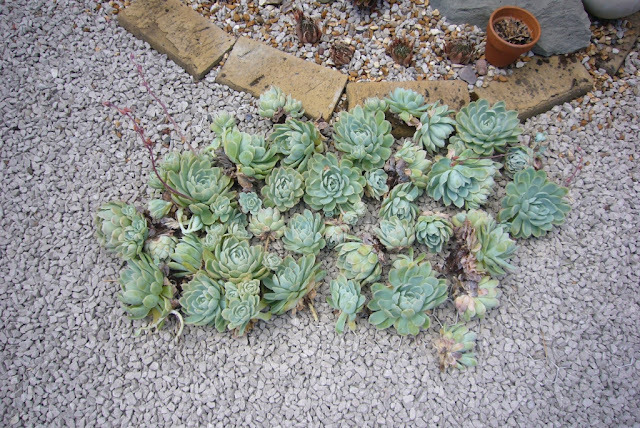 The stream of echeveria elegans has grown slightly since it was first planted. When is was planted back in 2014 it was almost just individual plants. 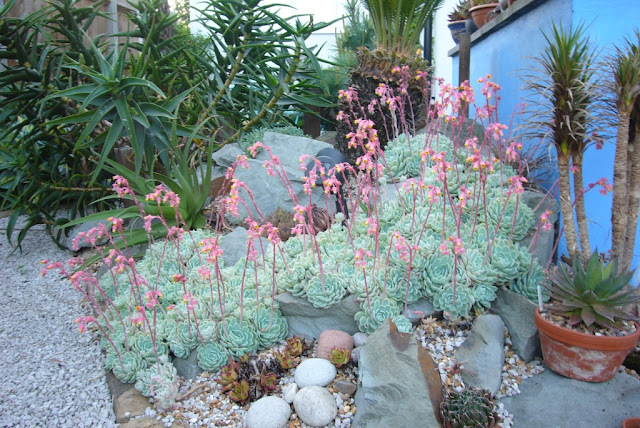 Then the great things about echeveria are the rate the spred. It now takes up the whole space, and come spring it flowers more each year. The plants also change colour over winter to add a bit more colour. 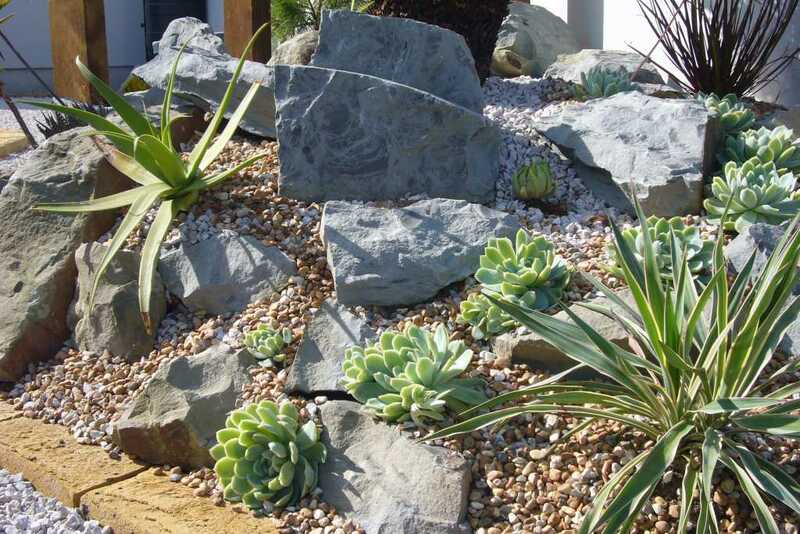 The nice things about echeveria, is to sculpt the shape require, simply pull the unwanted plants away form the clump. I would love to have another echeveria on the lower level, but the E. agavoides keeps rotting as this area is not covered at all. I am toying filling it with aloe aristata. 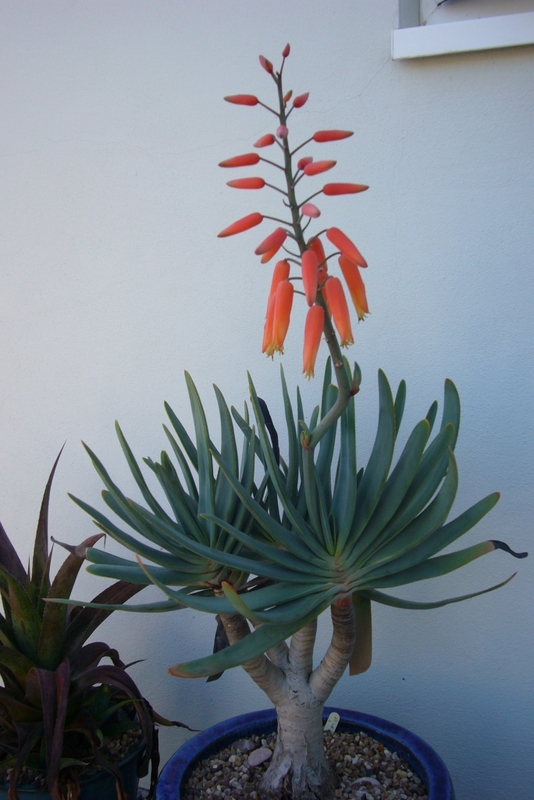 there would be some variation in colour and the flower season would be extended as just as the echeverias finish the aloes start. Then there is the bonus of one or two spare plants. I mayhave to extend the clump in the front to create a new stream where there is more space. 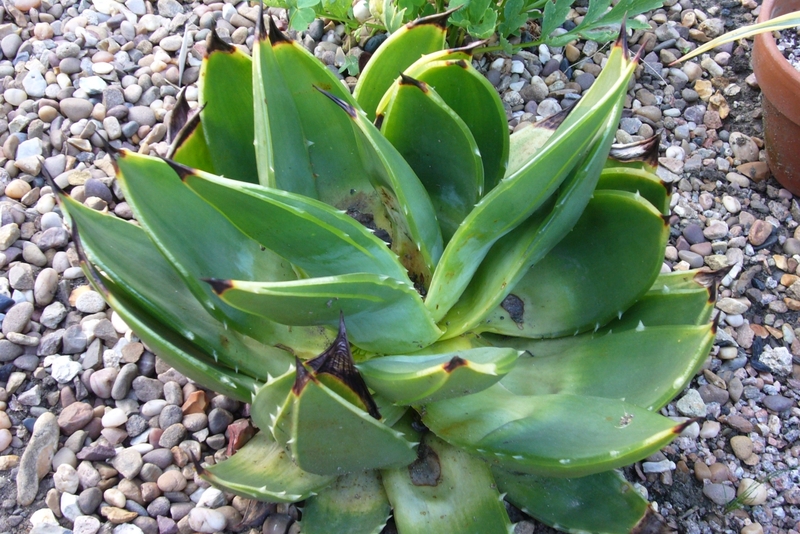 There are very few aloes that are hardy in the UK. A. striatula and A. Aristata are the two that seem hardy across larger parts of the Uk without needing any protection. Then A. polyphylla and A. saponaria in the warmer parts, or if given protection from the snow and rain. There are a few more people grow, but they seem to be much more variable. So I grow all 4 in the garden and have had them all flower at different points, A. Polyphylla for the first time last year, but sadly not this year. The rest are flowering better than ever. The photo above shows the largest clump of A. striatula. There are three clumps around the garden, all flowering and two, for once, aphid free. You can see that it is rampant, and has turned my ordered, tidy succulent bed into more of a jungle. 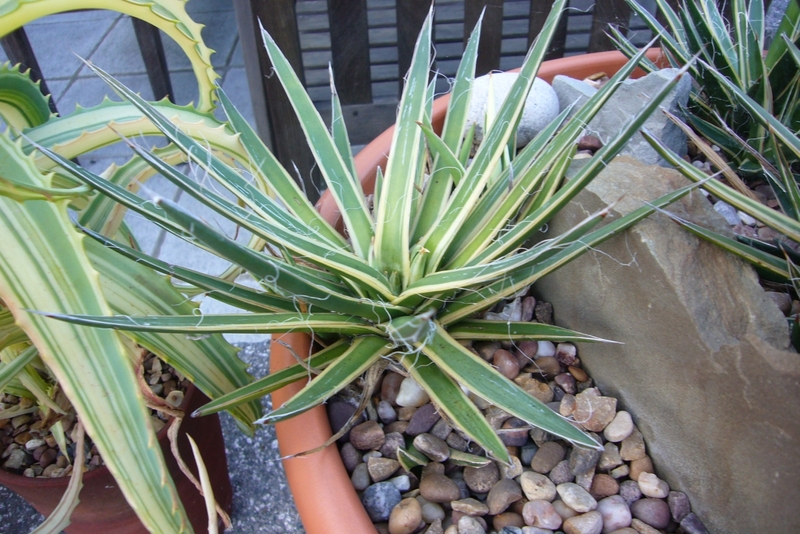 There are two groups of A. aristata just out of the photo and several in pots. 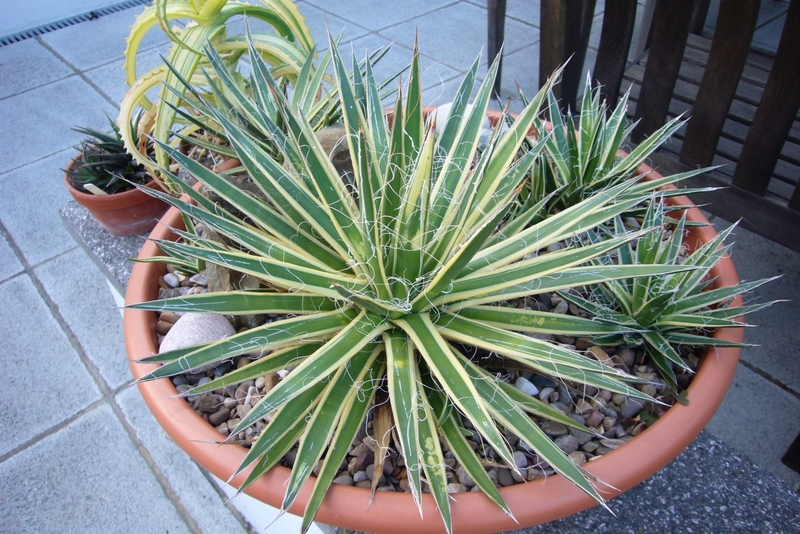 I have them in pots so they can be moved to fill gaps, or placed next to other aloes in flower. The A. saponaria I have is a variegated clump. 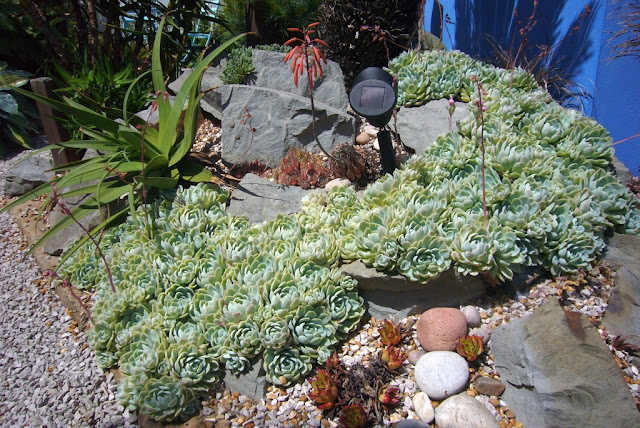 It started off as one plant, and is now a clump of variegated plants, some better than others. I am always surprised it survives each winter and then flowers. This years flower is the best to date. The flowers have good colour and are a decent size. In the morning sun it glows, the photo does not do it justice. The bees are a bit unsure of the aloe flowers, they are finding out how to access them so seed pods have been few to date. This year with everything flowering so well, it may be time to try some hybrids. I was thinking about which to try and remembered I already owned an A. aristata x A. striatula which is very disappointing in both looks and hardiness. So it looks like it is going to be A. aristata x A. saponaria and A. strataula x A. saponaria instead. To try and ensure the best success, I will be getting the paint brush out to help everything along. 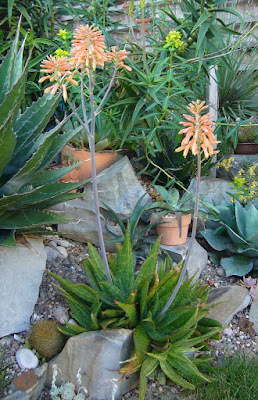 There are lots of other aloes in flower as well, mainly the smaller ones. The only larger one in flower is no longer strictly an aloe, but kumara plicatilis. The flowers has lasted really well, holding their colour and not just opening and dieing with in a day or so. 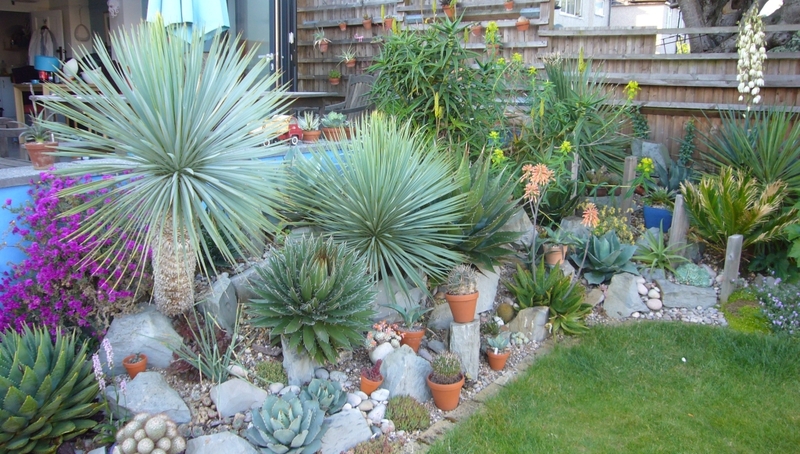 Then you have the haworthias and the aloe x haworthis crosses, but that may have to be another year. You know what they say: never throw a succulent away. So back from the usual winter off-line, a bit later than usual this year. There are good reasons not least an amazing long holiday in Cuba. An actual holiday, not work, or a short break between busy times. That is for another post, as a belated report on winter damage is required. The London winter was long, wet and with several longer cold spells. The main succulent bed was relatively unscaved and is already looking good again. The main damage was not here but in the new mixed bed where I was testing an agave x-nigra and an aloe polyphylla. I choose a great year to test them and stupidly didn't cover them at all. 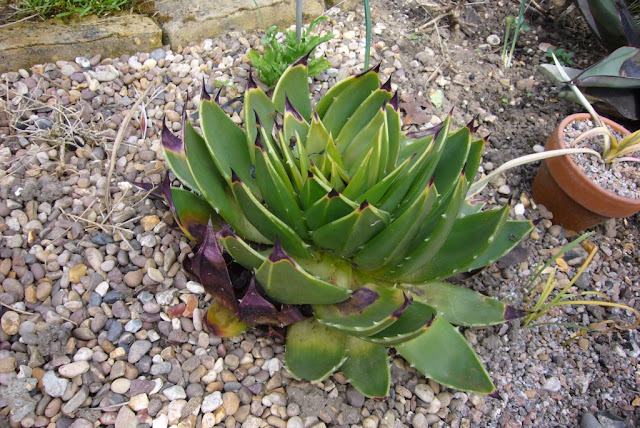 The nigra is gone, the centre aloe polyphylla rotted. The photo above was taken in April, I have been pulling out any loose leaves, and removing any sign of rot. As you can see bellow, it does not look pretty. 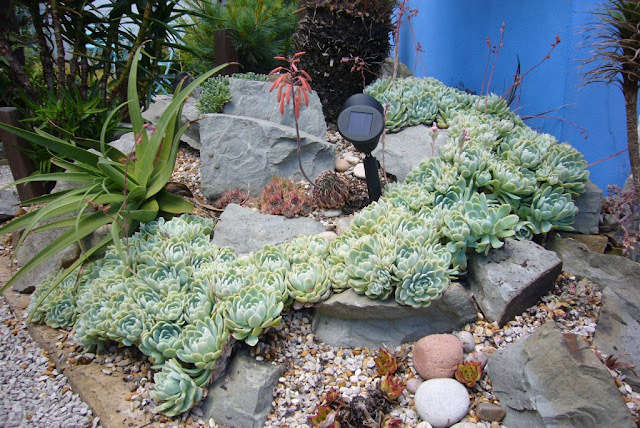 So as the this post title suggests there is a general rule that you never throw a succulent away. I have tried before a propagation method called coring: you cut the growth point out and this forces offsets from the centre. It tends to be used to propagate rare or variegated plants. Looking at the aloe, the similarities were obvious. 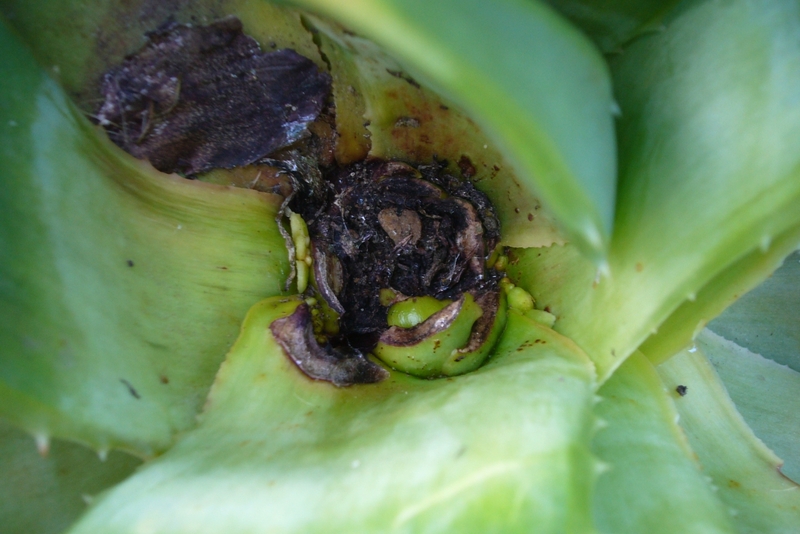 The core of the medium sized plant also rotted, so as with the aloe, it was a case of removing rot, damaged leaves and taking the centre back to a clean state. So a month later and there are already signs of several new plants growing from the core. As these develop the other leaves will slowly be removed to provide more space. 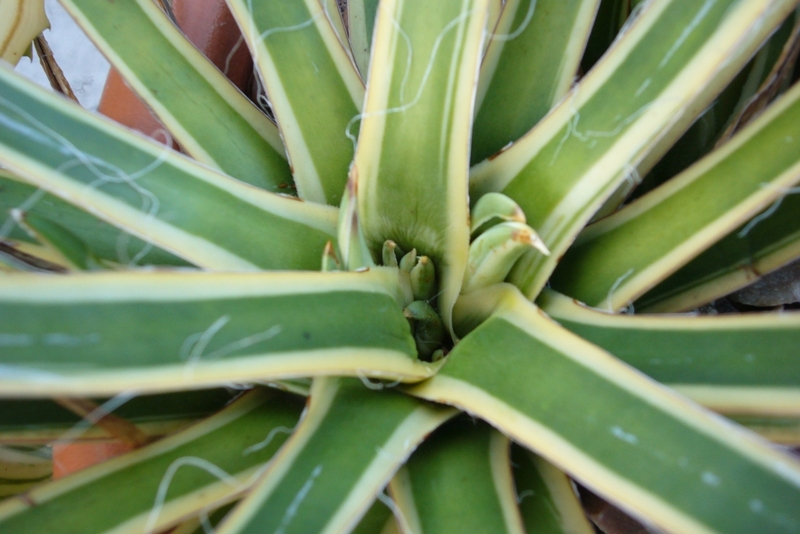 This agave tends to clump, so it will be left to get on with it. But I know you don't really care about he agave, what about the aloe polyphylla? There are definitely signs of new growth which is really interesting. I was kicking myself for not protecting the plant in the forcast bad weather, so a clump of aloe polyphyllas would be a far better result than I deserve. So yet again, that basic rule proves to be true. Never throw a sucuelnt away!